Use the slicing blade on the food processor to thinly slice the cabbage and carrot. In a bowl, mix it with the remaining ingredients. Set aside. Pulse the parsley and mint in the food processor. In a bowl, mix it with the remaining tabbouleh ingredients. Set aside. Smash and peel the garlic. Place all ingredients in the food processor and whirl until smooth. Set aside. Cut cauliflower into large florets. Rice cauliflower using shredding blade on food processor or grate by hand on a box grater. Heat oil in a large frying pan over medium heat. Add cauliflower rice, sauté then add bone broth and simmer until just cooked through, about 5 minutes. Mix all the spices in a small bowl. Rub the spice blend over the chicken. Heat oil in a non-stick skillet over medium high heat. Place chicken in the pan and cook it undisturbed for 5 minutes. Flip the chicken and cook for 2 minutes. Add bone broth, cover and reduce heat to low. Cook until chicken is no longer pink inside (approx. 10-15 minutes.) To serve cut the chicken into thin slices. Fill a bowl 1/3 red cabbage salad, 1/3 tabbouleh, 1/3 cauliflower rice, top with chicken and drizzle with tahini dressing. If we have to start dealing with the cold, at least having this turmeric chicken and sweet potato chowder in our tummies will ease the blow. Sweet potatoes, sweet corn and spinach along with Bone Brewhouse bone broth make for a ton of flavour and nutrition. And, by using Bone Brewhouse bone broth you cut down time spent in the kitchen because we do most of the work for you. Our nutrient-rich bone broths are simmered in kettles for up to 24 hours using cage-free, Canadian chicken and all-natural seasonings. Unlike conventional broths and stocks, this extra-long process extracts collagen and minerals from deep within the bones that offer tremendous health benefits. Add all ingredients to a large pot. Cover, bring to a boil and simmer till the sweet potatoes are soft. I then mashed the sweet potatoes for a thicker consistency (optional). Turn on the fireplace, wrap yourself in a blanket and enjoy! It’s comfort food season and I’m stocking my freezer with Bone Brewhouse bone broth. It’s my go to when the days are short and I’m craving a warm, healthy meal. They are incredibly tasty, nutritious and you don’t have to be a top chef to put a bowl like this together… soothing lemon ginger bone broth with chicken and winter greens. All I did was add chicken and red kale to Bone Brewhouse Lemon Ginger bone broth. You can’t go wrong, the soul of the broth really comes through. I’m very happy with how well my dinner turned out. It’s warm and soothing with all the benefits of bone broth. PERFECT for these current chilling temps. Black rice! Have you ever tried it? It’s a whole grain rice rich in B-vitamins and antioxidants. The colourful outer layer of black rice is actually a deep, eggplant-like purple created by compounds called anthocyanins, the same antioxidants that give grapes and blueberries their distinctive hue. Research has linked anthocyanins to a wide variety of health claims, including increased longevity, cardiovascular health, cancer prevention and dementia. For added nutrients, I cooked the black rice with 2 cups of bone broth for the first cup of rice, and a cup of water for each additional cup. Once cooked, I fluffed the rice with steamed spinach and served it with soft boiled eggs and beets. Enjoy! The Bone Brewhouse bone broth adds a new layer of flavour to this butternut squash soup. Not to mention it instantly transforms the soup into a nutrient dense powerhouse deliciousness! Chop a small to medium butternut squash into 1 inch cubes and toss into a large pot. Add Bone Brewhouse Traditional bone broth, and water till the butternut squash is covered. Salt and pepper to taste. Bring to a boil and cook until the squash is soft. Use an immersion blender or a potato masher to fully puree the squash. Add seasonings: fresh thyme, green onion, optional diced carrots, potatoes or dumplings. And simmer for another 30 minutes. It’s as simple as that. Typically, I put some leftover soup into containers for lunch right away, to make the morning that much easier. This bone broth butternut squash soup is a simple dish with tons of flavour! Enjoy! I try my hardest to incorporate bone broth into as many of my meals as much as possible. Not only do I drink a mug every day. I also use it in any savoury recipes that calls for water. I steam vegetables with bone broth. I use it to make rice. I boil sweet potatoes in it. I have even poached eggs in bone broth! It makes me feel good knowing that I am adding more nutrients to my diet. This weekend, I was experimenting with a quick, homemade marinara sauce, without added sugar like most of the ones you can find in the store. Sugar is added to combat the acidity from the tomatoes, but grated carrots will do the same trick minus all that annoying sugar. The sauce was getting quite thick so I used bone broth to thin it out… and just like that, I had a bone broth marinara. Heat a medium sauce pan on medium heat and add olive oil, warm for 1 minute. Add garlic, onions, mushrooms and green peppers, sauté till fragrant. Add the remaining ingredients, simmer for 10 minutes stirring occasionally. Blend for 1 minute with an immersion blender or carefully transfer to a blender (optional). Add additional salt and pepper or meatballs!! Enjoy! This skillet sweet potato hash with eggs is a filling, savoury, healthy meal for any time of day. Sweet potatoes, coconut oil, bone broth, green peppers, green onions, and eggs cooked right into the hash, it's Paleo and Whole30 friendly plus absolutely delicious! Preheat oven to 400 degrees. Spiralize one sweet potato. Heat a cast iron pan on low add the coconut oil, sweet potatoes and green peppers and stir for a few minutes so it doesn’t stick to the pan. Add 1/4 cup of Bone Brewhouse Traditional bone broth and let simmer till your sweet potatoes are tender. Make wells in the sweet potato and add your eggs, Pop it into the oven for approximately 5-7 minutes. Garnish with chopped green onions, salt and pepper and enjoy! This Paleo Cauliflower Soup has one secret ingredient known to heal the gut. It’s called… bone broth. This recipe is a wonderful way to get your veggies AND your bone broth in, so enjoy! Drink bone broth because you want to; not because you have to. 1. In a large pot, place the cauliflower florets. Boil till tender. Reduce heat. In a separate pot bring bone broth to a boil then reduce heat. 2. Place half the cauliflower and half of the broth, into a blender (or food processor) and blend well. Add the rest of the cauliflower and broth and blend again. Salt and pepper to taste, and top with cheese. Serve it while it’s hot! This is based on a family cabbage roll recipe, deconstructed – because who has time to roll 36 cabbage rolls. And, I’ve added a secret ingredient… Bone Brewhouse Traditional bone broth. It tastes great and it’s good for you. 1. Sauté the onion and ground beef till cooked. Add cabbage and cook down till soften and caramelize a bit. Add a few pinches of sea salt while it’s cooking to bring out their juices and let them sweeten up. 2. Add in the rest of the ingredients to the cabbage and onions, and cook through on medium heat for about 5-10 minutes. 3. Season to taste and serve over rice or mashed potatoes. Enjoy! One very simple and nutritious way to use our Bone Brewhouse broth is to make an egg drop soup. Here’s our take on this Chinese classic, which turns our Pho bone broth into a complete, well balanced meal. It doesn’t get any better than this! 2. Once boiling, reduce to medium heat and add bok choy. Cook over for a minute. 3. Finally, whisk the eggs in a small bowl. Add the chives to the soup and turn the heat down to gentle simmer. Pour the egg mixture slowly and gradually into the pot (over a fork) and stir in. The egg will cook right away. Turn the heat off and add chives and pepper (optional). Celebrate that special man in your life with a healthy bone broth risotto. I doesn’t get any better than that! Happy Father’s Day to all the great dads out there! Wishing you all a wonderful day! Place Bone Brewhouse Traditional broth in a saucepan and bring to a simmer. meanwhile, in a large saucepan sauté mushrooms over medium high heat with a splash of olive oil until lightly browned and most of the moisture has been removed. Add leeks and garlic, cooking for 2 minutes. Pour in uncooked rice with another splash of olive oil and stir to combine. Cook, stirring for 1 minute. add in fresh thyme, lemon juice and zest. Here comes the fun part… ladle the simmering chicken broth into the rice, half a cup at a time, continuously stirring until the liquid is absorbed. Repeat the process until you are down to your last ½ cup of broth (approx.. 30 minutes). At this point stir in asparagus. Tip: your risotto should be very slightly al dente when done. If you do not feel like the rice is tender enough then feel free to add more warm broth or water, a ladle at a time, ensuring your risotto does not turn to mush. Take note that the rice will continue to cook a little bit after it has been removed from the heat source. Salt and pepper to taste, top with a handful of fresh basil (optional) and enjoy! Spring is turning into summer (I promise you)… and this savory bone broth asparagus quiche has both written all over it - the freshness of spring and the easy going-ness of summer with all the health benefits of bone broth. A simple and easy dish you can make for breakfast, lunch or dinner! I just can’t get enough. Preheat oven to 350F degrees. Place the pastry dough over a greased 9 inch pie dish. To save time I used store bought dough. Place the mozzarella cheese over the bottom of the crust. Add more cheese if you prefer. Make a layer of asparagus, trimming it to fit the dish all around. In a medium bowl, beat the eggs and add the milk and bone broth, parmesan cheese and salt and pepper to taste. Pour eggs mixture over the asparagus. Garnish with parmesan cheese, salt and pepper. Let’s get real. Mashed potatoes that are Whole30 (as in dairy free, soy free, sugar free, and gluten free) are completely DEE-LISH. Whether you like your mashed potatoes lightly mashed or smooth and creamy, Bone Brewhouse Traditional bone broth in place of milk and butter makes them 100% Whole30 compliant. The bone broth is incredibly nourishing and adds a ton of flavour to this easy dish. Just mash your boiled potatoes and add bone broth till you reach your desired consistency. Enjoy! I went on my traditional asparagus picking trip this long weekend. I made soup because if you’re like me, we’re still experiencing some cold spring weather. If not, you should still make it because it’s delicious and it’s made with Bone Brewhouse Traditional bone broth! Heat olive oil over medium-high heat, add leek, garlic, red pepper flakes and sauté for 3 minutes. Add chopped asparagus and sauté another 3-4 minutes. Add frozen peas, bone broth, water and bring to a boil. When the soup starts to boil, cover with a lid, lower the heat to low and simmer until the asparagus is very tender. Remove from the heat and use an immersion stick or blender to blend the soup until it is smooth. Stir in the Greek yogurt, salt and pepper to taste. Transfer to serving bowls and top with parmesan cheese. Enjoy! Thyme + bone broth + spinach + booze = a yummy cold and cough cure broth-tail. It’s warming, soothing and it’s sort of like soup, only it can get you tipsy… which really is something soups ought to learn how to do anyways. Brew thyme sprigs in Bone Brewhouse bone broth for 10 minutes, strain and transfer to a blender. Add booze and spinach blend and serve in a coffee mug. Start things off right on Mother's Day — by spoiling her with a bone broth, bacon, mushroom and sweet potato frittata. Oh, and don’t forget the flowers! 1. Heat oven to 375. Fry the bacon on high in a 9" cast-iron frying pan. Toss in the sliced mushrooms. Cook about five minutes, stirring periodically. 2. Add the scallions and stir for about a minute. Toss in the red peppers and grated sweet potato. While the sweet potato is cooking, stir periodically. Crack all of the eggs into a big bowl, add the broth and the thyme, and whisk vigorously. 3. Once the grated yam look like it's softening, pour the mixture over everything, do not stir. 4. Cook for about three minutes on the burner before sliding into the stove. Set the timer for 20 minutes and voila! Happy Mother’s Day everyone! Veggies will absorb nutrients from whatever they’re cooked in – so why not steam or sauté them in bone broth? And when it comes to veggies, you can steam almost anything… broccoli, spinach, kale, carrots, green beans, cauliflower, Brussels sprouts. 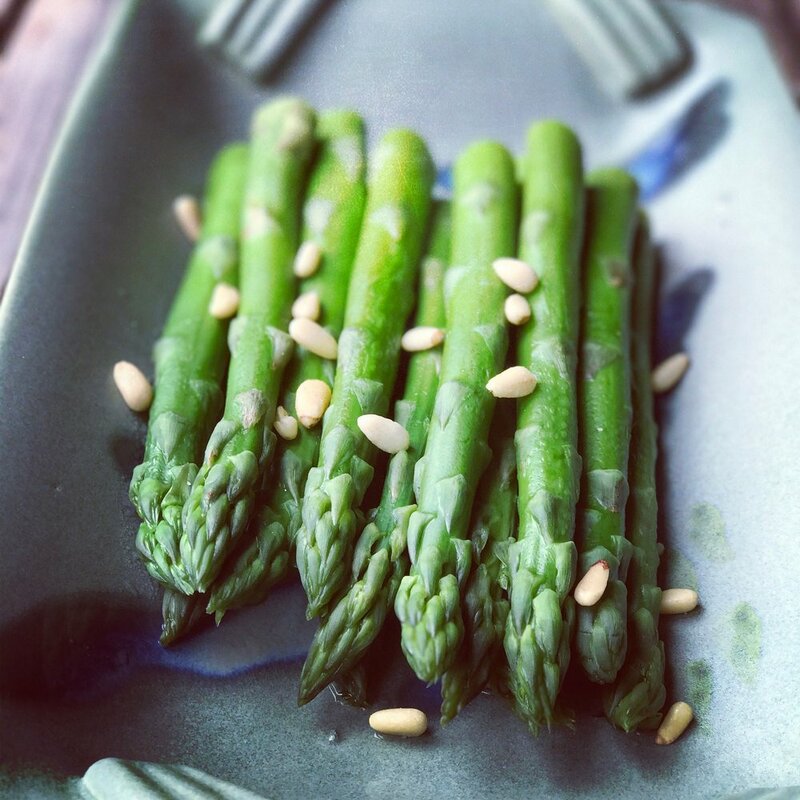 Where we live asparagus is starting to come into season… So, we've been steaming asparagus. Add a few cloves of garlic and a dollop of butter at the end, and voila – your perfect side dish is ready. 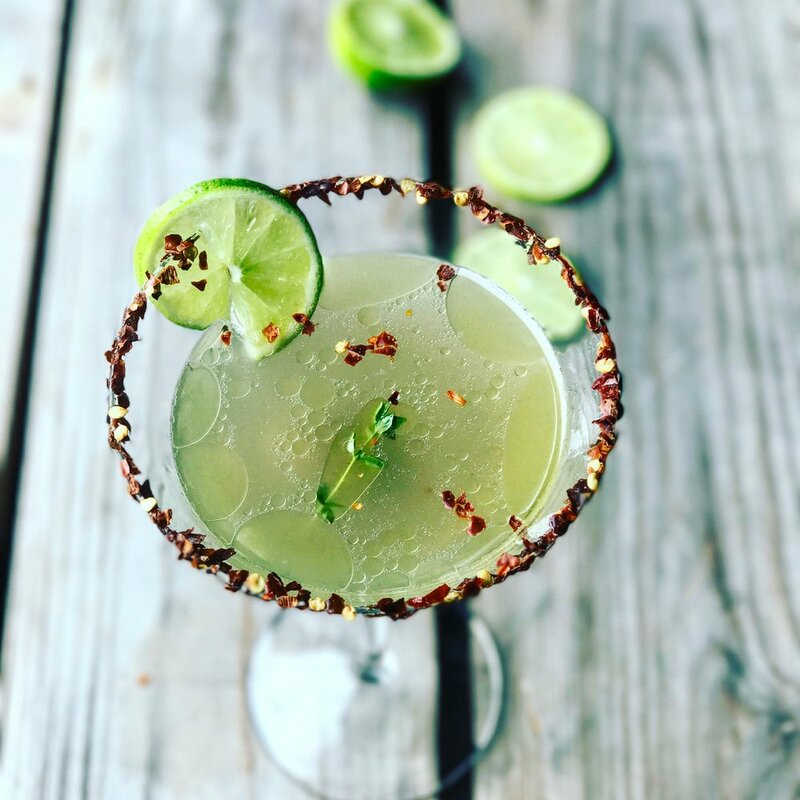 While the first drink that comes to mind might be a traditional margarita, why not spice up Cinco de Mayo with a Bone Broth cocktail! Heat broth until room temperature. Rim a martini or margarita glass with chili pepper flakes. Mix all the ingredients in a shaker and pour into your glass. Get all the tremendous health benefits of bone broth, spinach and coconut oil in before noon. This bone broth latte keeps you energized and focused, while not taxing your adrenals with the caffeine of coffee. It’s also perfect for anyone following a low-carb and/or ketogenic diet. Simply simmer 2 cups of spinach with Bone Brewhouse Traditional broth. Remove from heat, add 2 tablespoons of coconut oil or butter or ghee and blend in a blender till smooth and frothy. Wok-fried zucchini noodles with spicy Pho bone broth on a lazy afternoon. Happy Sunday everyone! Open a container of Bone Brewhouse Pho bone broth, heat in medium pot. Meanwhile, use a spiralizer or vegetable peeler to create zucchini noodles. Set aside. Heat coconut oil in a wok or pan over medium-high heat, place zucchini noodles and garlic and quickly sauté, tossing the noodles in the hot oil, about 1 minute. 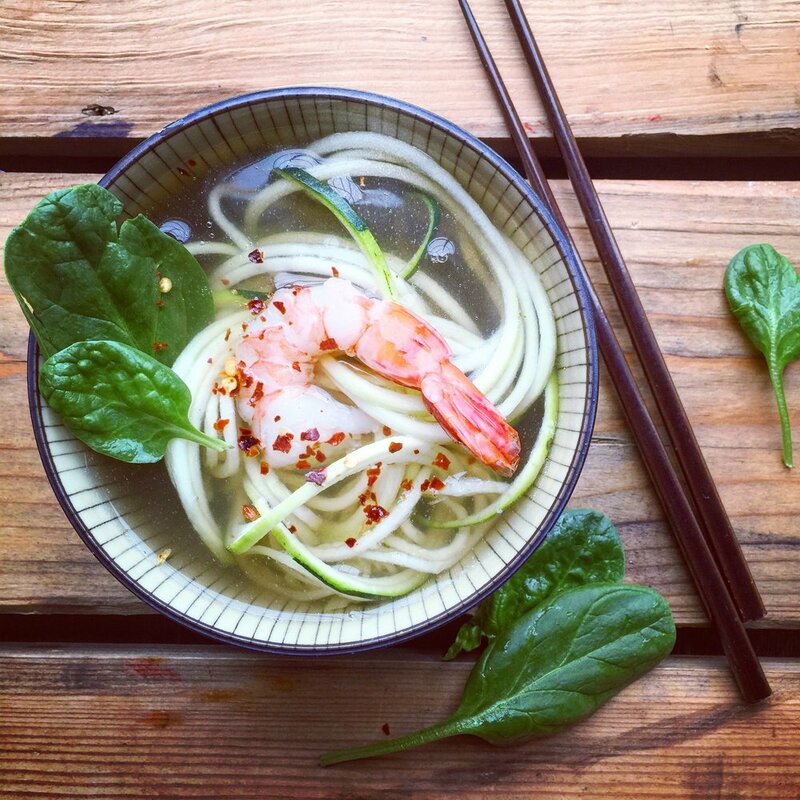 Remove from heat and transfer noodles to a bowl, add bone broth and top with cooked shrimp, chili peppers and basil leaves.